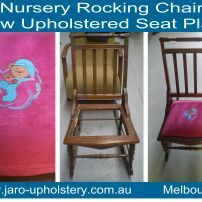 commented on "Antique Rocking Chair Restoration - Reupholstery by JARO Upholstery, South East Melbourne"
commented on "Antique Arm Chair with Fluted Back - reupholstered by JARO Upholstery, Melbourne"
JARO can restore antique chairs to give them either a traditional or modern look. Feel free to send through a picture of your chair and we can give you an idea of what it would cost to restore. 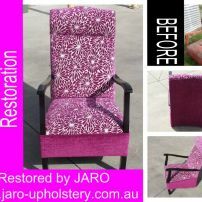 Send pictures to enquiries@jaro-upholstery.com.au. commented on "Rocking Chair Reupholstery & Restoration"
JARO can help you restore your family heirloom with with traditional or modern fabrics. 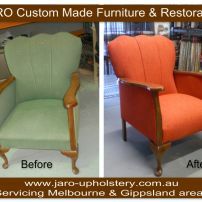 Feel free to send through your pictures to enquiries@jaro-upholstery.com.au for a no obligation quote. commented on "Antique Diamond Buttoned Arm Chair Restoration"
JARO can restore antique chairs to give them either a traditional or modern look.